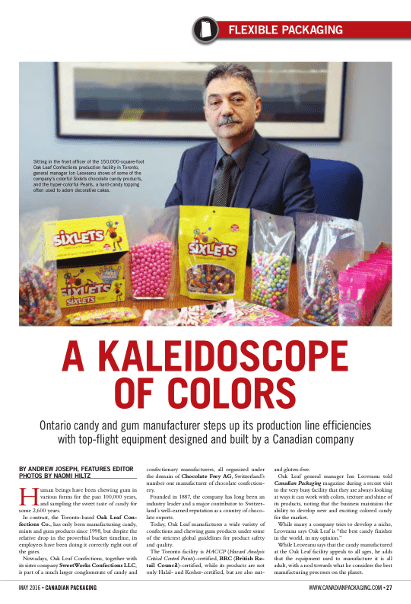 Ontario candy and gum manufacturer steps up its production line efficiencies with top-flight equipment designed and built by a Canadian company. Human beings have been chewing gum in various forms for the past 100,000 years,and sampling the sweet taste of candy for some 2,600 years.In contrast, the Toronto-based Oak Leaf Confections Co., has only been manufacturing candy,mints and gum products since 1998, but despite the relative drop in the proverbial bucket timeline, its employees have been doing it correctly right out of the gates. Nowadays, Oak Leaf Confections, together with its sister company SweetWorks Confections LLC, is part of a much larger conglomerate of candy and confectionary manufacturers, all organized under the domain of Chocolate Frey AG, Switzerland’s number one manufacturer of chocolate confectionery.